Neck pain, and especially the ‘text neck’, is becoming an epidemic. A research from 2014 (shared by Quartz) showed that in the United States people spend an average of 444 minutes (so a stumbling 7.4 hours!) every day looking at screens. Researchers at Harvard Medical Health predict that 7 out of 10 people will experience neck aches at some point in their lives. And about 50% to 85% of these people will be bothered by it again within the next five years. Before we start, I want to give you a short explanation of what exactly happens with our necks when we sit behind a computer for a long time. Awareness about what exactly is happening is the first step to change old habits. When we sit behind a computer (or other screen) we tend to slouch in our backs, bringing the weight at the back of our sit bones. This slouching position creates a whole range of problems to our spine: typically the head moves in front of our spine, the shoulders start to round forward and the back becomes curved. Slouching compresses the sternum, which creates stiffness in the muscles in between the ribs, and leads to shallow breathing and thus to a higher level of stress. The biggest issue of the ‘screen neck’ though, is the compensational movement in our neck: we lift up our head by overarching our neck, because we still want to see the screen in front of us. This creates compression in the neck, which makes the neck unstable and creates an unbalanced pressure on the discs in between the cervical vertebrae. It is this pressure that creates the typical neck related injuries like chronic neck pain, sudden neck stiffness, or even worse, slipped discs in the cervical spine. Solution for neck pain: Get your head back on top of the spine! To solve our neck pain, it is essential, that we do not only look at the area that feels sore, aka the neck itself, but search for the source of the text neck: most likely a slouched, stiff upper back. Only if the upper back releases it’s muscle tension and the immobility of the spine, the head will be able to move back to it’s natural position: on top of the spine. As soon as the upper back extends into a straighter position, it will give space for the neck to lengthen as well, so the discs in between the cervical vertebrae can recover. This way, the head will be able to move back on top of the spine, and the weight of the head (for adults a wobbly 8 pounds) will move downwards with gravity through the spine into the sit bones, without leaving any remaining strain in the muscles of the neck or upper back. Aaahh, what a relief. Critical Alignment Yoga developed a prop called the ‘strip’, which, I believe is the invention of this century. Honestly! 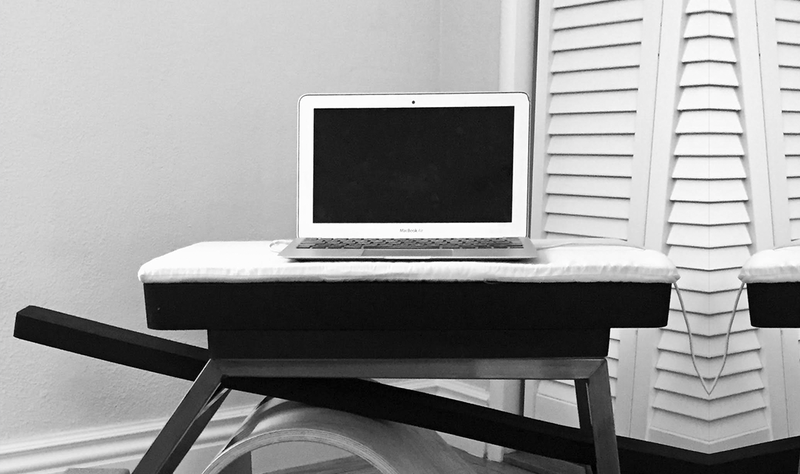 I bring it along whenever I have to travel, because it’s relatively small, it weighs almost nothing, it’s cheap and it is a fantastic fix for the stiffness in the upper back and soreness in the neck, whenever I had a long trip. Check out the exercises below on how to use the strip. NOTE: make sure you always follow up exercise 1 with exercise 2. 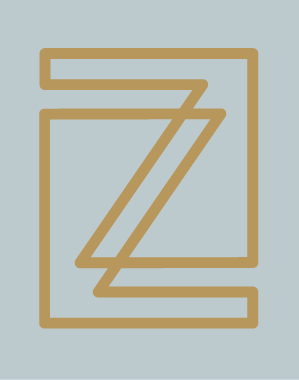 But Zita, I have no strip! I got you! Although I think that the strip is a ‘must-have’ for people with neck pain, I understand that you want to have another exercise to counter the text neck. In which I recommend a mini-shouderstand. Check out exercise 1B for the explanation. Fold the strip and place it behind your head and upper back, with the loop sticking out just an inch or two above your head. Lie down on the strip, bend your knees and place your feet on the floor. Your hands are lying on your lower ribs; elbows are lying on the floor. Let your shoulders move down towards the floor with gravity. Close your eyes and connect to your breathing. Stay in this position for a couple of minutes, using exhales to get heavier on the strip, allowing the pressure of the strip onto your spine. Realize, that by lying down on the strip, your spine is being pushed into a straightened position. This can feel a bit uncomfortable, especially when your upper back is stiff. Do not worry, the longer you lay on the strip, the more your muscles will let go of their stiffness and ease into the pressure. Press your feet into the floor, and lift up your pelvis towards the ceiling (which will roll up your spine), until you cannot go any further. Feel that this will create space in your neck to lengthen, and allows your back of the head slide away from your back. Inhale into your sternum, and exhale into the pressure of the strip, without moving your pelvis down. Think of melting into the pressure of the strip against your vertebrae just underneath your neck. The pressure will press the vertebrae deeper into the body, more in alignment with the neck. Keep a light pressure of the back of your head against the strip, to make sure your neck stays long with the following movement: slowly start to roll your back down the strip, vertebrae by vertebrae. Inhaling towards the sternum, exhaling into the pressure of the strip and then moving one vertebrae down. When your pelvis is on the ground, notice that your spine feels heavier on the strip. Stay in this position for a couple of minutes, breathing into the newly gained space in your ribcage and around your sternum. Use your natural inhale and exhale to massage the muscles in between the ribs. Roll to your side to get off the strip. Push yourself from the side position up to sitting position. 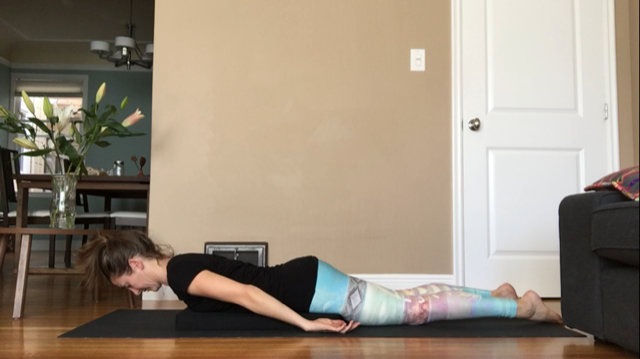 Place the strip to the side of your mat. Grab a yoga blanket (if you have a stiff neck, use two blankets or more) and fold them 4 times. Grab a chair and place it behind the behind the blanket. Lay down on your back on the stacked blankets with your upper back, your shoulders are placed on the blanket as well. Your head is on the floor. You’re leaning against the seat of the chair. Grab the feet of the chair with both hands. Place your feet against the side of the chair. 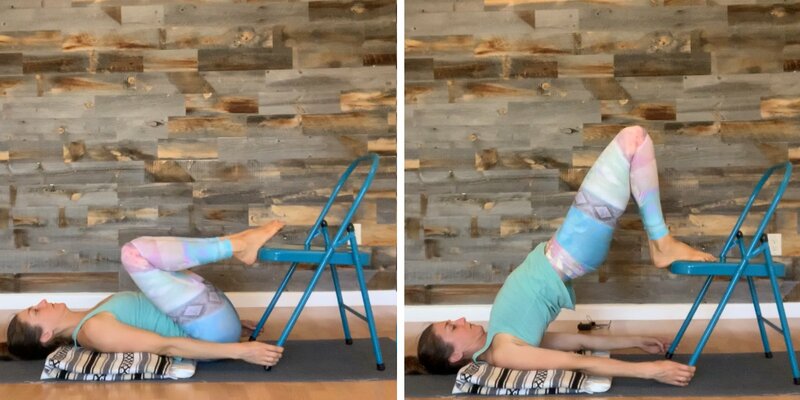 Hold on to the feet of the chair when you start to push your feet into the chair. Slowly lift up your sternum towards your chin, your pelvis is following this upward movement. Bring your shoulders underneath you, to create more space around the sternum and collarbones. This upward movement will create space for your neck to lengthen away from your body. Let that happen, without tucking your chin to your chest. You should be able to completely let go of the muscles around your throat. Note: your pelvis is always behind the sternum, otherwise you move up with a compressed sternum, and this is exactly what we don’t want! 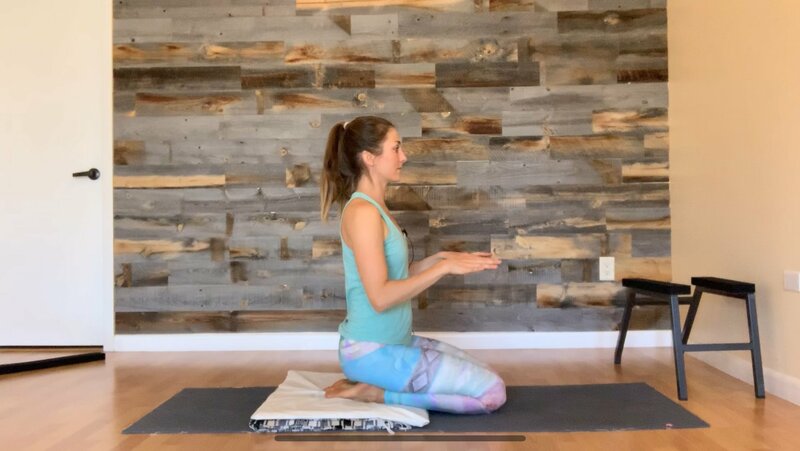 Stay in this position for a couple of minutes, inhaling into your sternum and exhaling without letting your pelvis sink to the floor or collapsing your sternum. 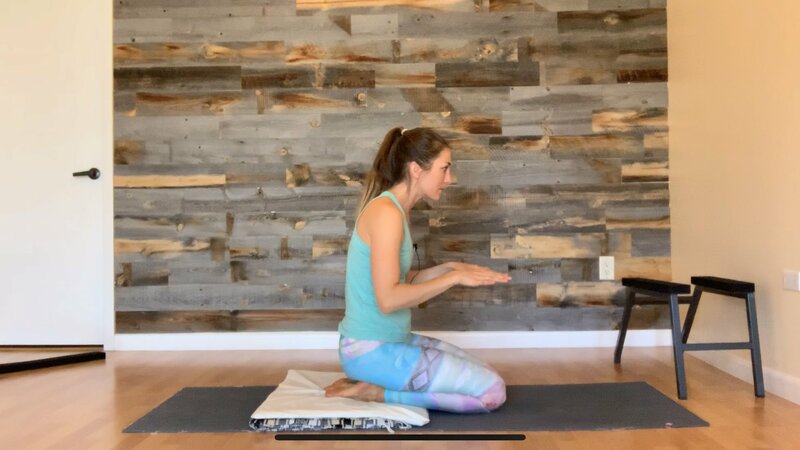 Note how this exercise is completely countering the typical screen posture: Our spine is now arched, the arms move behind us, the shoulders are opening, your sternum is opening and your neck is long. This will reduce all stress from you back muscles, create mobility in the spine and will strengthen your upper thighs. Lay down on your belly, with your upper forehead on the floor and arms alongside your pelvis. Notice that gravity will naturally move your shoulders down towards the floor. The back is slightly rounded and the sternum compressed. Your breath will therefore move towards your back. Now inhale towards your sternum, slightly pressing your sternum against the floor. When you exhale, keep the pressure of your sternum against the floor, especially the lower part of the sternum. With your next inhale, lift your head up from the floor, in line with your spine. Your head is now hovering above the floor. Imagine you are placing the back of your head against the imaginary strip against your back. The neck is long, as if your back of the head is sliding away along the strip. Your deep postural muscles of your upper back and neck are now carrying the weight of your head. Keep inhaling and exhaling into the slight pressure of the sternum against the floor. 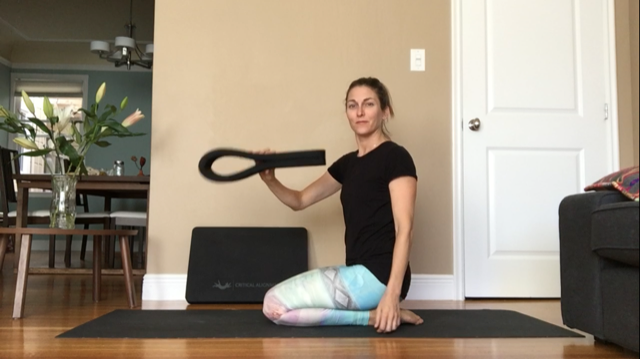 Imagine your spine is moving down towards your sternum with each inhale and exhale, this will create a straightening and lengthening of the spine. Stay in this position for a couple of minutes, or as long as you want. It will create strength in the upper back and neck, that will prevent the neck to collapse as soon as you sit or stand straight up. Exhale to lower down your head. Repeat the steps above a couple of times to create stronger postural muscles in your upper back. These postural muscles will help keeping your upper back straight and give space to the neck to straighten and move on top of the spine as well. EXERCISE 3: Savasana, to let the body adjust to the effect of the new exercise. 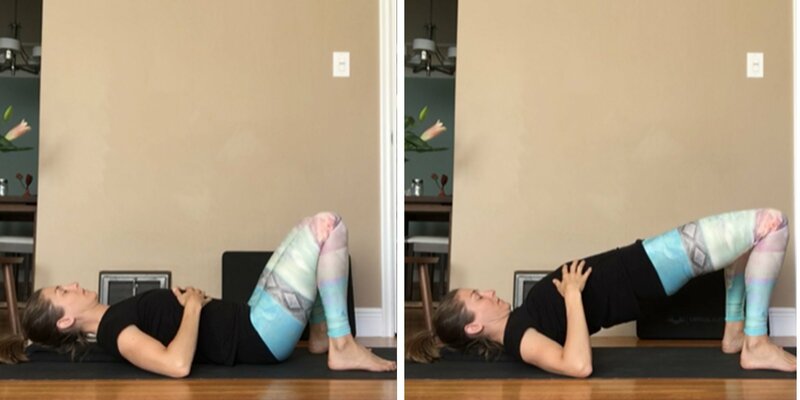 Lay own on your back, stretch out your legs and let them fall open, place your arms with hand palms up next to your body, and let the weight of the body sink into the floor. Let go of the tendency to move anymore, and simply observe how the body is reacting to the exercises before. Let go of any judgments, and appreciate the fact you have done these exercises to recover from neck pain. Smile. This is a practice you are going to want to return to. Bookmark it to restore the natural curve of your spine, to realign the shoulders and upper back, and to relief the text neck. Never without the Critical Alignment Yoga strip again? Want to try out the strip yourself? Come to my classes at Yoga of Los Altos! Or buy a strip, either from me if you live in the Bay Area or from the Critical Alignment Yoga shop. What do you think about these exercises? And what do you do to get rid of neck pain?